In 1843, just 13 years after the Church's organization, Church President Joseph Smith called two men to preach in Russia. This assignment was canceled after the martyrdom of Joseph Smith in 1844. In 1895, a native of Sweden was sent to St. Petersburg, where he baptized the Johan M. Lindelof family. The family was occasionally visited by Church leaders in the early 1900s. In 1959, Ezra Taft Benson of the Quorum of the Twelve Apostles, simultaneously serving as United States Secretary of Agriculture, visited the Central Baptist Church in Moscow and preached to an attentive congregation. In September 1989, Church leaders authorized a United States Embassy worker in Russia to begin holding group meetings in his apartment. Four months later, in January 1990, missionaries arrived in Leningrad. The first convert they baptized also became the first full-time missionary from Russia, who served in the Utah Ogden Mission. In February 1990, a congregation was organized in Vyborg. By mid-summer 1990, the Leningrad congregation, created in December 1989, had 100 members, and the Vyborg congregation had 25 members. In September, the St. Petersburg congregation was recognized by the government and in October a religious freedom law was passed. With membership in Russia at 750 in February 1992, two other Russian missions were organized. In June 1991, the world-renowned Mormon Tabernacle Choir received publicity "beyond its wildest expectations" as it performed in the Bolshoi Theater in Moscow and in Leningrad (now St. Petersburg). The choir recorded songs later broadcast to a potential audience of 339 million. In May 1991, the Church was officially recognized by Russia. 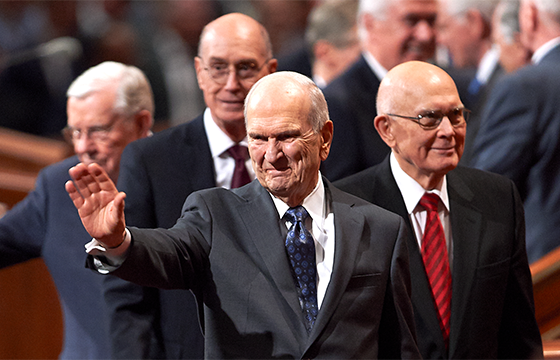 Elder Russell M. Nelson of the Quorum of the Twelve Apostles, organized the Moscow Russia Stake on 5 June 2011 — the first stake in Russia and the second in the former Soviet Union.